Ever dreamed of living under the sea? It seems that dream will soon be a reality. Designed by the Japanese company Shimizu Corp’s, this masterpiece is expected to cost over $25 billion dollars and take five years to complete. The design starts with a living sphere, spanning over 457 metres below the surface of the ocean. Dubbed the Ocean Spiral, the proposal forms a residential and commercial core with a path that spirals approximately 14.5 kilometres into the deep, rendering the ocean floor non existent. Occupants of the underwater community would live and work both in triangular neighbourhoods along the border as well as within an hourglass-shaped, skyscraper segment stretching from the bottom to the top of the sphere’s centre. The ‘Earth Factory’ portion of the proposal is set to generate eco-friendly energy from temperate differentials and organically-driven chemical conversion processes. Don’t get too excited, anyone wondering when the city is expected to materialise may be waiting a while – as its creators concede the technology is not quite in place yet. 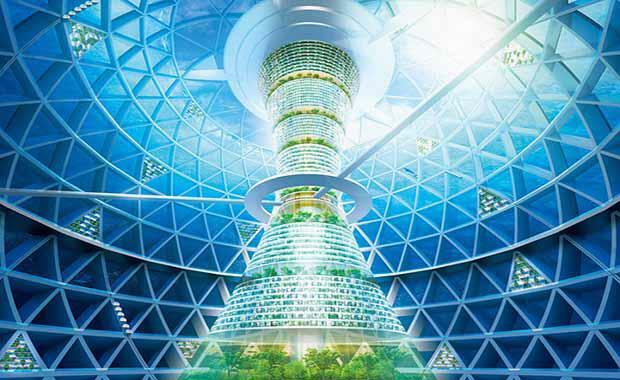 It may be another 15 years before the technology is available to make this dream a reality with Shimizu saying the first city could be ready for residents by 2030.